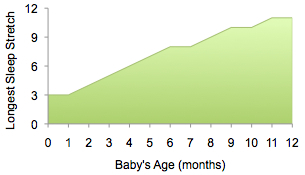 Here’s a guide to how much sleep your baby should get at night and throughout the day, broken down by baby’s age. Please note, this is adjusted age – the amount of time that has passed since your baby’s due date. 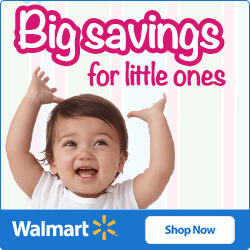 How Much Do Babies Sleep at Night? How Many Naps Per Day? How Does Your Baby Compare? This is the burning question, isn’t it? First, the bad news: newborns eat and sleep on 3-4 hour cycles. 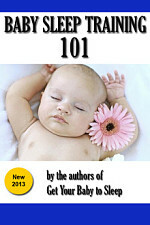 By the age of three months, however, newborns can hold enough food to sleep for longer, perhaps 5-6 hours at a stretch. The key is to make sure everything’s just right at bedtime, and that your baby’s eaten until full and content. When your baby goes to bed for the night, you go to bed! You can get some solid hours here, so don’t waste them. Over the next couple of months, you might get as many as 7-8 hours in a stretch overnight on good nights. Say, midnight to 7 a.m. The next big change happens at around 6 months. This was the age when our pediatrician told us to start solid food. What a difference that made! The introduction of single-grain cereal, and later, Gerber-style baby food, made a dramatic difference in sleeping hours for all three of my kids. It almost certainly will for you, too. A newborn “officially” takes something like 5-6 naps daily, but it’s really more as they doze somewhat continuously throughout the day. It varies from baby to baby, but most newborns eats every 3-4 hours and sleep in between. There’s not much awake time, which is hard because they’re so darn cute! 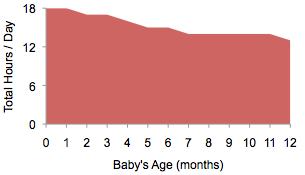 Fortunately, the amount of time awake increases steadily with your baby’s age. Somewhere between 3-6 months, your baby will probably settle into a nap schedule of about three naps per day: late morning, early afternoon, and late afternoon / early evening. There could be a fourth nap from after-dinner to around midnight, if you wake your baby up for the last feeding of the night. So how many hours does a baby sleep each day? With newborns, it will seem like all the time. Actually, it’s around 18 hours initially, with the other time devoted to eating, burping, diaper changes, and probably some crying. This decreases slowly but steadily; by six months, it’s probably around 16 hours a day, and by 12 months, your baby likely sleeps about 12 hours between overnights and 1-2 naps. Don’t worry if you feel like your baby is sleeping too much! A lot of parents seem concerned by this, but as long as your baby eats on a regular schedule and is gaining weight, you should just count your blessings. 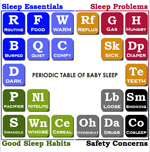 This table breaks down what you can expect in terms of nightly sleep, naps, and total sleep by your baby’s adjusted age. 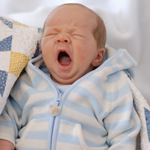 When it comes to sleeping habits, all babies are different. Even twins are different. You might look at the table above and think that your baby is way off from where he or she should be. Or, you might not know – after a few weeks of sleep-deprived nights, everything starts to run together. That’s why I recommend keeping track of your baby’s eating and sleeping patterns in a log book like the one to the right ($16 on Amazon), at least for the first several months. Not only will it give you an accurate record of your newborn’s habits as they change, but it will also make a nice keepsake for a time in your life when, let’s be honest, the memories might be a little bit fuzzy. There’s no way to sugar coat this: newborns wake up and eat every 2-4 hours, 24 hours a day, for the first couple months of their lives. Other than that, they sleep most of the day – 16 to 18 hours if not longer. The best way to deal with this is to establish a routine and plan your own sleep accordingly – schedule the nighttime feeding to occur right before your bedtime, feed the baby, and go right to bed yourself. When he wakes up, change his diaper, feed again, and put right back to bed. Keep the lights as low as possible, so that your baby doesn’t get too stimulated. You can set up a little night light somewhere away from the crib to help you see without waking the baby up. 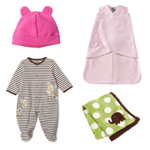 See my post on what your newborn should sleep in to maximize your baby’s comfort in bed. At 4-6 months your pediatrician will probably tell you to start offering them a little bit of baby cereal (not grown-up cereal) once a day. If that goes well, you can add a bit of cereal to the nighttime bottle to help baby sleep longer. At six months with the introduction of solid food, I guarantee you’ll turn a corner. Here’s how to get your baby to sleep through the night. First, go and read the article on Nighttime Feeding and Sleep. At dinner time, you should be able to feed your baby 1-2 servings of solid food. Some baby foods (carrots, squash, sweet potatoes, and many fruits) can be thickened with a teaspoon or so of single-grain cereal (rice or oats). This not only makes them easier to feed your baby, but also does a better job of filling his belly. After dinner and possibly a bottle, let your baby sit or play (not on their stomach) for a bit until he starts to fuss – that means he’s ready for bed. Go through your nightly routine and put him down. Your baby will self-soothe better at this age, too. The first time he fusses, a few whispered words of comfort and re-insertion of the pacifier will often calm him down enough to go back to sleep. With our twins, we do this three or four times, or until they refuse to settle back down, before picking them up.